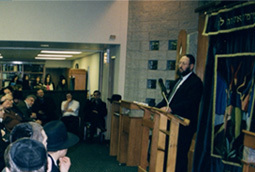 The following shiurim were given by Rabbi Moshe Rosenstein. 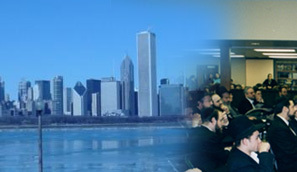 They were recorded live at the Chicago Community Kollel. They are part of an ongoing series of classes and symposia taking place at the Kollel, devoted to increasing awareness and devotion to our daily Tefillos. This project was begun to serve as a zechus for cholim in our city, as well as around the world, and for our brethren in Eretz Yisroel who live in increasingly difficult times. Other shiurim - delivered by such noted speakers as Rav Moshe Tuvia Leiff and Rav Shmuel Dishon shlit"a - devoted to this topic, are available on tape from the Kollel. Please contact us for ordering information. The Five Minute Halcha Shiur is also available on audio cassette. Please contact us for ordering information. The latest shiurim are available in MP3. Please be aware that there may be some delay while the sound files load enough to start streaming. How is the Sheim Hashem Pronounced? Shmoneh Esrei - Where should one's eyes be during Tefillah?